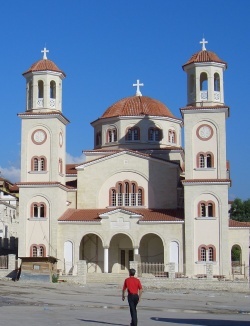 The Church of Albania is one of the autocephalous Orthodox churches whose territory consists of the Republic of Albania. The Church of Albania as a church using the Albanian language is a latecomer to an ancient region of Europe. The heritage of the Byzantine Roman Empire that resided in the areas in which Albanians lived meant that Greek was the language of their churches. It was only in recent times, that is, the last hundred years or so, as nationalism came to the forefront in the Balkans that the idea came of an independent Albanian country in which the Orthodox church would use Albanian as its liturgical language. The idea of an Albanian liturgical language was in part realized through the efforts of an Albanian Orthodox émigré in the United States of America who began translating the Orthodox services into Albanian, became an Orthodox priest, and began using the Albanian translations among Albanian communities both in America and Europe. This was Fr. Theophan (Fan) Noli in 1908. He was also part of the nationalist movement. At the same time, the nationalist movement for an independent Albanian nation bore fruit with a declaration of independence in 1912. The declared independence was ratified after World War I when the League of Nations granted membership to Albania. Fr. Noli was also in the political forefront as this new nation was formed. Now consecrated a bishop in Albania, he was named Bishop of Korca and Metropolitan of Durres, and the ruling hierarch of Albania. In 1922, a Council held at Berat proclaimed autocephaly for the Albanian church over the objections of the Patriarch of Constantinople who, in 1926, offered an agreement that would lead to future autocephaly. This, the Albanian government rejected. In 1929, two Albanian Orthodox bishops were consecrated by Bp. John Bessarion and a Serbian bishop. Thus, a synod of bishops was formed in Tirana and the church repeated its declaration of autocephaly. A schism ensued between the two churches until on April 12, 1937, when the Ecumenical Patriarch recognized the autocephalous status of the Albanian church. In the meantime, the church organization developed. Diocesan sees were established at Tirana, Berat, Argyrokastro, and Korytsa. Albanian began to be used more widely as Albanian translations of the service books became available, replacing Greek as the liturgical language. In 1937 an Orthodox seminary was founded at Korystsa. The peace of the church was savagely destroyed when the communists took over the government of the country in 1945. Influential Orthodox clergy were executed, and in 1949, the Archbishop of Tirana, Christopher Kissi, was removed from office, thus beginning the systematic removal of bishops who were not acceptable to the communist regime. The communists became more and more oppressive, exceeding even the oppressive measures in other communist regimes in Eastern Europe. In 1967, the regime closed all religious institutions and forbade any religious practices. At the same time, Abp. Damianos of Tirana was sent to prison where he died in 1973. The church was virtually destroyed. As the communist world began to disintegrate in 1990, the government in Albania followed in its disintegration. The persecution of the Church ended, but the Orthodox hierarchy had been destroyed. Having granted autocephaly to the Albanian church, the Patriarch of Constantinople stepped in to guide the Albanians in their recovery. He appointed Metropolitan Anastasios of Androusa as Patriarchal Exarch in Albania to begin the reconstruction of the autocephalous Orthodox Church of Albania. On June 24, 1992, the Holy Synod of the Ecumenical Patriarchate elected Anastasios as Archbishop of Tirana and All Albania. The Synod also named three other bishops to the diocesan vacancies, but the government refused their entry into Albania, calling instead for the appointment of ethnic Albanians. Tensions continued between the Greek-centered hierarchy and the Albanian government over naming ethnic Albanians to the hierarchy of the Albanian church. This was complicated by tensions between the Greek and Albanian governments over the ethnic Greek minority in Albania. The situation was finally resolved in 1998, when by mutual agreement among the Ecumenical Patriarch, the Albanian Church, and the Albanian government, Metr. Ignatios of Berat, who was one of the three bishops named earlier by the Ecumenical Patriarch, was enthroned, the other two hierarchs resigned, and two ethnic Albanians were elected. Archimandrite John Pelushi was elected Metropolitan of Korytsa (Korça) and Fr. Kosma Qirjo was elected Bishop of Apollonia, thus forming a full Holy Synod for the Church of Albania. In 2000, Bishop Kosma, who was 77 years old when elected, died and has not been replaced. Since 1991, the re-established Church has built over 83 new churches and five monasteries. Some 72 churches and monuments have been renovated and restored and over 140 churches have been repaired. In temporary facilities, the Resurrection of Christ Theological Academy was opened in March 1992 and moved to new facilities at the St. Vlash Monastery in Durrës in 1996. There were only 22 Orthodox priests alive when the communist regime collapsed; of these, only three were living in 2003, but by 2003, the seminary graduated 128 priests, all Albanian citizens. A severe shortage of priests continues. This page was last edited on February 22, 2015, at 13:32. This page has been accessed 67,288 times.